Connecting to MySQL is pretty simple. 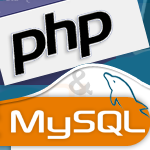 There are several different ways of doing it through PHP like MySQLi and PDO. The way I usually do it is creating a mysql class that contains the connect, close, select, insert, and all the other functions readily needed for using PHP and MySQL. Unfortunately some clients that I work with don’t always use PHP 5 or higher.. So here is the way to connect just using functions so that it will work with earlier versions of PHP. You can assign the database connection properties as variables, contants, or hard coded. Today I am going to pass variables into the function. You could also get much more detailed with it and make error handling if connection fails, but again… not today. Also below is all the necessary PHP MySQL function. Check em. Good for Reference when not using a framework. 6 Responses to "PHP MySQL functions"
This is a great right up. I’ll be using this tomorrow to try and reconnect MySql. Also, don’t forget your writeup about the mod rewrite and .htaccess. Thanks agian. I strongly recomment moving the the mysql pdo extension. It’s structure is object oriented and I have read that the mysql_xxxx libs will get deprecated in the future version of PHP. You can extend the pdo_mysql class. I strongly agree with Simon Ferragne – in fact, we should no longer be advocating the use of mysql at all (soon to be deprecated!). It’s insecure and we should always use properly parameterised queries so as to avoid sql injection. PDO makes this easier, or we can use mysqli but never mysql.